This is the large bloom of the Stellar Constellation Dogwood one of Rutgers hybrids developed by Dr. Elwin Orton at Rutgers University. 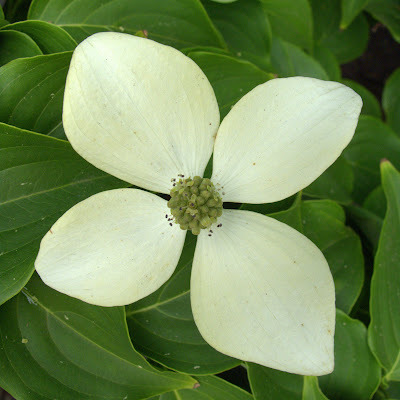 These are a cross between American and Kousa (Chinese) dogwoods. They have larger blooms, bloom later and are disease resistant. Picture taken at the historic College Avenue Campus in New Brunswick, New Jersey. Canon G10, 1/500 sec @ f/4.5, ISO 200 in macro mode. very nice ad clean shot- I like how direct it feels!